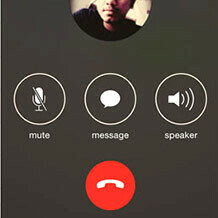 Jelly of the WhatsApp voice calling feature that Android users (well, at least rooted ones) can enjoy now? Can't wait with patience for the official WhatsApp voice call to arrive for your iPhone? Fret not, as you can take it for a spin right now, as users are reporting that they can freely install the newest WhatsApp beta version from the company's website, and be on their merry way. Voice calls on the iPhone version of WhatsApp requires that you have version 2.11.17.444 of the messaging app, which is, unfortunately, still in beta. 3. If you decide to go back to the official version, do not install it from the App Store before you have removed the beta, as your chat history might get lost during the overwrite. That's that, you can test drive the new WhatsApp calling feature on your iPhone right now. Some users are reporting issues with the call option on iOS versions above 8.1, and others claim you need to be jailbroken and install the Cydia tweak, but it should be working even if your phone isn't jailbroken. Also, if the other device you are trying to contact has official WhatsApp versions installed from the Play or App Store, calling them would obviously not be possible, as they don't have the latest beta that can be downloaded from the WhatsApp link above. The video below explains the process for jailbroken iPhones, but it should work on your stock Apple handset like that after installation, too. It isnt even that handy, i have it on my android and i dont even use it. Well its more useless on I phones since they have faceless facetime call. Will I be able to do a group conference call?